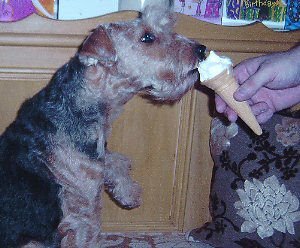 I have written before about animals and ice cream on my website, recalling a fond childhood memory of my little Yorkshire Terrier (Josie) who loved eating mini ice cream cones. I've also put links to video clips of people's pets eating ice cream - from dogs to cats, rabbits, parrots, horses and even a lizard! Well, I was reminded of just how much animals love ice cream when I met someone for the first time recently. Lee Rotherham breeds Lakeland Terriers, an unusual and beautiful breed of English terrier. Apparently these dogs have very unusual coats (in fact one layered underneath another) that grow in such a way as to provide a 'waterproofing' against wet weather. Isn't nature wonderful? Anyway, back to my conversation with Lee. I happened to mention how my little 'Yorkie' used to love ice cream. "Belle does too!" he exclaimed with excitement. Belle is one of Lee's prize Lakeland Terriers. "Well I would feature her on my ice cream blog .... if I had proof" I said. The next day I received this photo of Belle enjoying an ice cream cone. Isn't she cute? I just had to share this with my Blog Of Ice Cream readers! If you love reading about dogs, especially terriers, you'll probably want to learn more about Lakeland Terriers. Lee is based in the UK and here is his Lakeland Terriers website. If you're outside the UK you might like to read the Nancy Kiss Caliente Lakelands website. Nancy is based in Canada.